Cassava Bread Recipes Special .Make a compote of cassava. For those who have never tried it surely will wonder true that cassava can be made ​​compote is delicious? Of course you can, and you can immediately try it at home by following the directions prescription us this time. How to make it very easy, usually use brown sugar as a sweetener. But the recipes compote special cassava bread we use sugar as a sweetener. His name is also special: D. The main ingredient in the form of cassava and bread. So that added fragrance added too jackfruit. Kolak is usually synonymous with the month of Ramadan, but there is no harm in occasionally you present after Friday prayers the family home or family time for their routine. 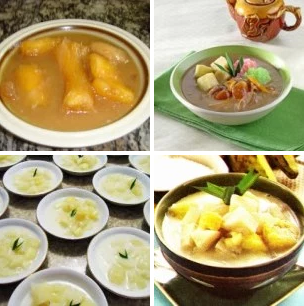 For those who want to try it, please refer to the following cassava compote recipe .. Boil coconut, cassava and vanilla until cooked pasta. Then add sugar and salt, and cook until absorbed. Then input dug seeds, stirring until blended. Then add grass jelly, jackfruit and coconut. Cook and stir again until blended. Lastly, serve compote with sago pearls and bread. 0 Komentar Untuk " Cassava Bread Recipes Special "